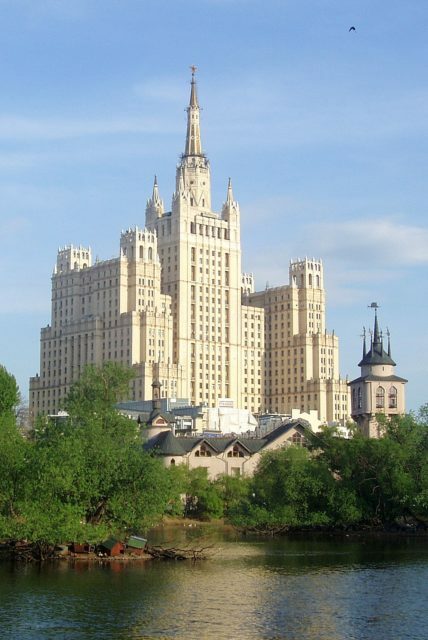 Also known as Stalinskie Vysotki (Stalin’s High-rises), The Seven Sisters of Moscow are a group of seven skyscrapers scattered around Moscow, built from 1947 to 1953. 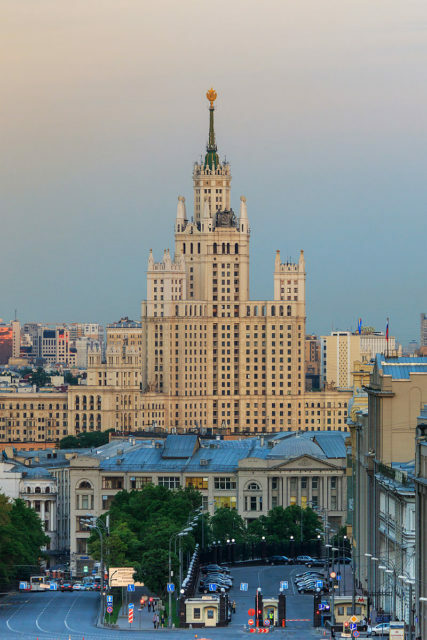 These massive buildings, made in a stylistic combination of Russian Baroque and Gothic architecture, are some of the most recognizable landmarks of Moscow. Today, they still stand tall and proud as reminders of a bygone era. Before the idea of Stalinskie Vysotki came, the Soviets began to construct their first skyscraper called Palace of the Soviets. This massive undertaking was stopped due to the German invasion of 1941. Later, when the war was over, an architect called Boris Iofan submitted six differents solutions for a new building at the same location, but all of those were rejected. Stalin had a different plan. In 1946 he decided to implement another idea which would start a massive construction project in Moscow. Stalin ordered the construction of several huge skyscrapers (vysotki) that would be completely different in style from the buildings made during the Comintern. Nikita Khrushchev remembered Stalin’s vision of the skyscrapers,: “We won the war … foreigners will come to Moscow, walk around, and there are no skyscrapers. If they compare Moscow to capitalist cities, it’s a moral blow to us.” Soon, the project began. In 1947, the locations for the future towers were chosen, and drafts for the buildings were already made. One of the first tasks at hand was building the skyscraper at Vorobyovy Gory, the one that was going to become the new Moscow State University. The prize for the best architectural solution for this object was given to Lev Rudnev, who soon became one of the most notable architects in the USSR. For his design of the Moscow State University, Rudnev was awarded the Stalin Prize in 1949. When the designs for all of the planned buildings were selected, construction work began. 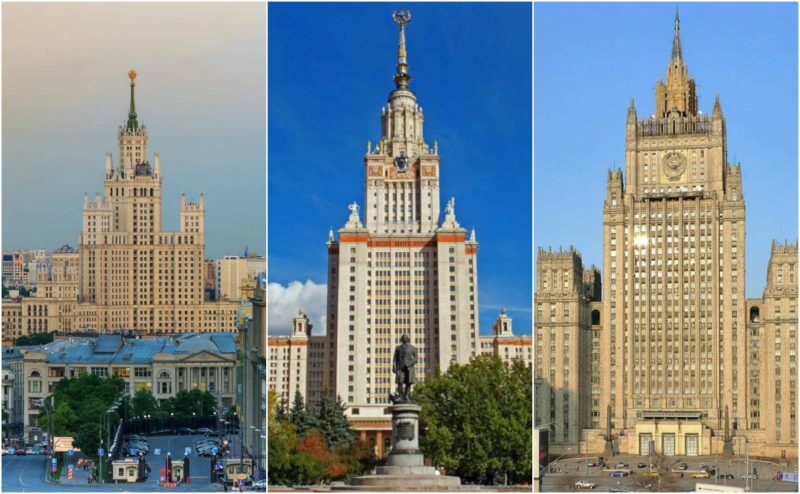 Here are the buildings that won the 1949 Stalin Prize and were chosen to be built. They are listed as they appeared in the April 1949 Stalin Prize decree. The names of the buildings are the ones used today. 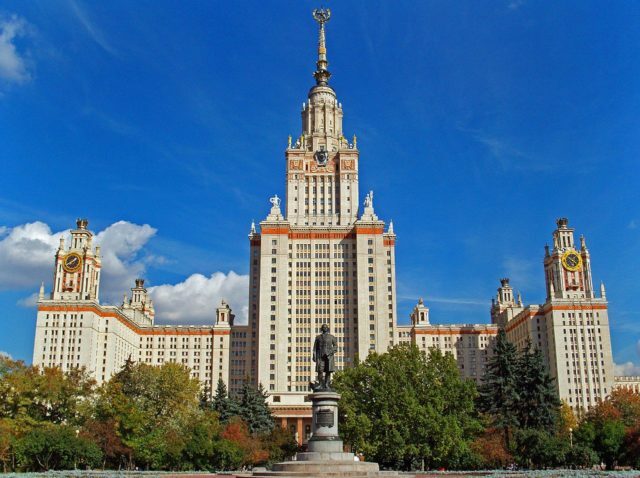 When the Moscow State University skyscraper was finished, it became the crown of the whole project. It was the highest and most beautiful building among the “sisters.” Although Boris Iofan was the main architect responsible for the skyscraper, he made a mistake in the placement of the building. There was a risk of landslide on the location that he chose, but he kept insisting that the building should stand there. Because Iofan was uncooperative, he was replaced by Lev Rudnev, an architect with prior experience with tall buildings and also, Stalin’s man. He decided to move the building some 800 meters away from the previous location (which was very close to a cliff). Because of the huge scale of the building, Gulag prisoners were also brought to work on it. Later, some of them were even accommodated on the 24th and 25th-floor to cut transport cost. The central tower of the skyscraper was finished on September 1st, 1953. Over 40,000 metric tons of steel were used during construction. The skyscraper is 787.4 feet (240 m) tall, and until 1990, it was the tallest building in Europe. 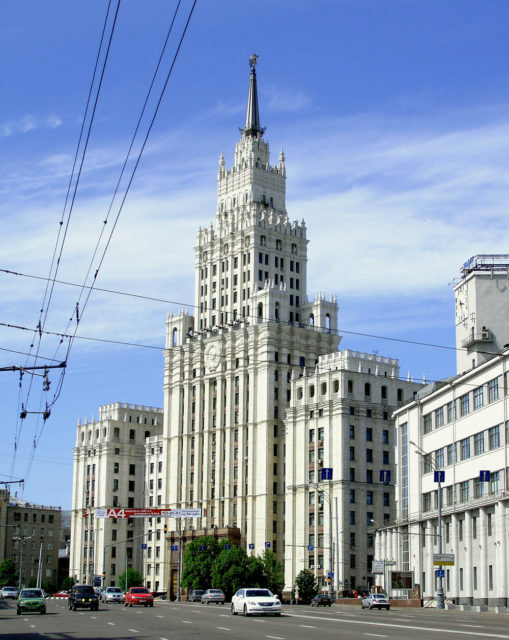 Even today, The Lomonosov is the highest institutional building in the world. This skyscraper, formerly known only as “Ukraina,” was created by Arkady Mordvinov and Vyacheslav Oltarzhevsky. It was the second tallest “sister” (198 meters and 34 floors). “Ukraina” also held the title of the tallest hotel in the world, but it got beaten in 1975 by the Peachtree Plaza Hotel constructed in Atlanta, Georgia. After a major renovation, the hotel was reopened in 2010. 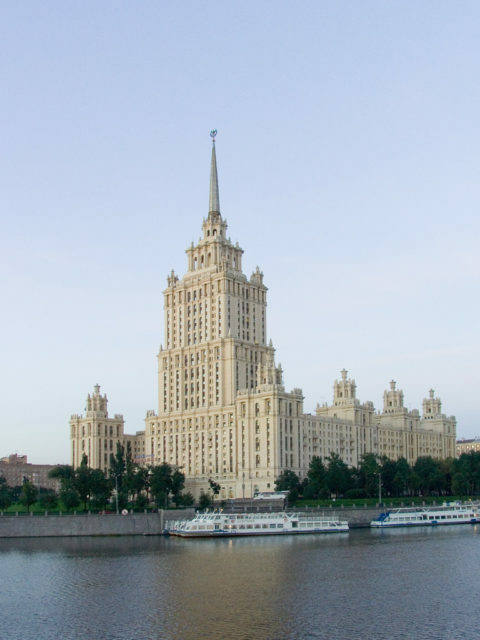 It is now known as Radisson Royal Hotel, Moscow, and it has 505 bedrooms and 38 apartments. 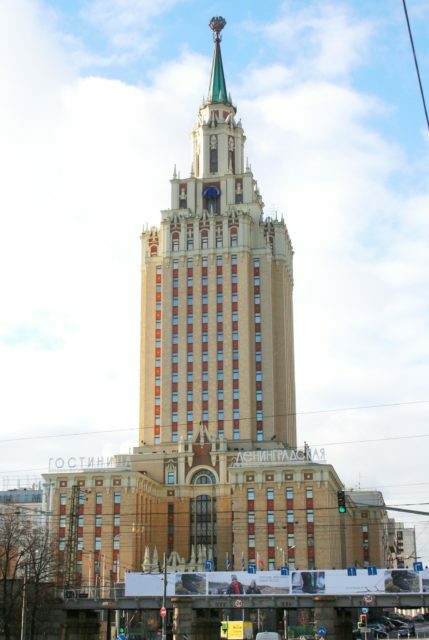 The current Ministry of Foreign Affairs for the Russian Federation building is also one of the “seven sisters.” The skyscraper construction was overseen by V.G.Gelfreih and A.B.Minkus. It was built between 1946 and 1953, and it is 172 high, with 27 functional floors. 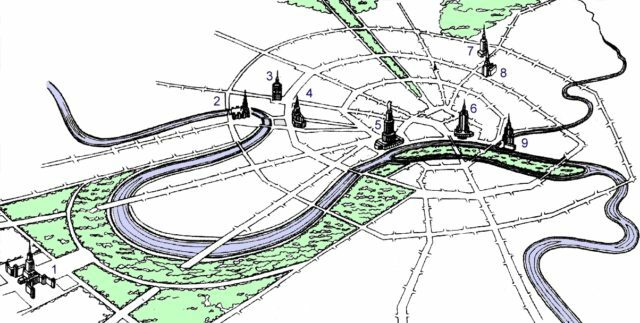 Out of the two designs which were proposed, the more streamlined one was selected. In the last phase of construction, it was decided (probably by Stalin himself) that a metal spire should be added to the top to make the building similar to the other sisters. In the past, it was known as the “Leningradskaya Hotel,” and it was created by Leonid Polyakov. This skyscraper that stands on Komsomolskaya Square is relatively shorter than the other “Sisters” which it is 136 meters high, and has 26 floors, of which only 19 are usable. The interior of the building vas very inefficiently planned. The “Kotelnicheskaya Embankment Building” is 176 meters high, and it has 22 usable floors. It is built at the point where the Moskva River and Yauza River meet. Initially, it was planned that this skyscraper would serve as an elite housing building, but after it was erected, it ended up as a multi-family communal apartments building, known as “kommunalka.” The exterior of the skyscraper is made in a neo-gothic style. Mikhail Posokhin (Sr.) and Ashot Mndoyants designed this 160 meters tall building of 22 floors, at the end of Krasnaya Presnya street to serve as an apartment complex for Soviet cultural leaders and politicians. Today, the apartments are inhabited by wealthy Russian citizens. “The Red Gates Administrative Building, designed by Alexey Dushkin,” is the shortest of the “Seven Sisters.” This 133 meters high skyscraper has 24 levels, and it once housed the Ministry of Construction of Heavy Industry and the Ministry of Transport Construction. Now it is building with several purposes. “The Red Gates” building is also known as the “Lermontov Tower,” because of the Lermontovskaya Square named after the famous poet Mikhail Lermontov. During construction, the whole structure was deliberately tilted to one side. Engineers expected that when the frozen soil beneath will soften in the summer, the building would settle down as it should. Although that happened, it was not entirely horizontal. The engineers pumped hot water into the soil to correct the error and managed to guide the foundations into the right position. The original plans for the group of The Stalinist skyscrapers included an eight building which was never made. 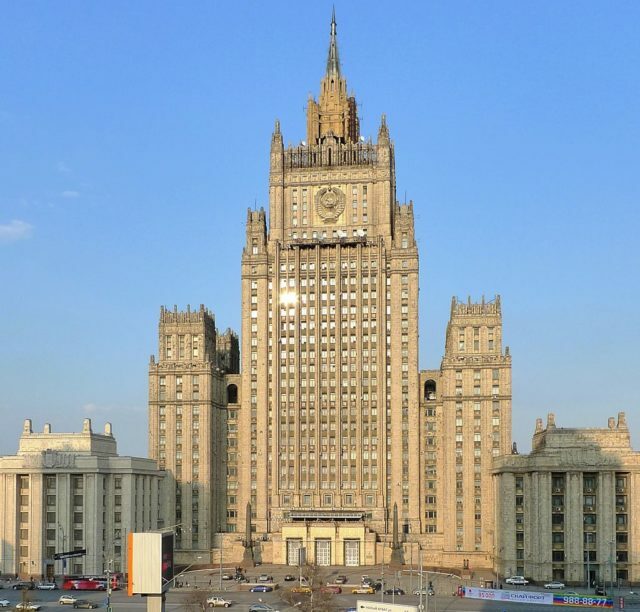 The eight “sister” was supposed to be the second highest after the university building, but they realized that it would overshadow the Kremlin and rejected the plans. The same design was later used for the Palace of Culture and Science in Warsaw, which is still the tallest building in Poland.